Uttarakhand (Sanskrit: उत्तराखण्डम्, Uttarākhanḍam ?, Hindi: उत्तराखण्ड, Uttarākhanḍ ? ), formerly Uttaranchal, is a state in the northern part of India. It is often referred to as the Land of Gods (Hindi: देव भूमि, Dēv bhūmi ?) due to the many holy Hindu temples and cities found throughout the state, some of which are among Hinduism’s most spiritual and auspicious places of pilgrimage and worship. Known for its natural beauty and wealth of the Himalayas, theBhabhar and the Terai, the state was carved out of the Himalayan and adjoining north-western districts of Uttar Pradesh on 9 November 2000, becoming the 27th state of the Republic of India. It borders the Tibet Autonomous Region on the north, the Mahakali Zone of Far-Western Region, Nepal on the east and the Indian states of Uttar Pradesh to the south and Himachal Pradesh to the north west. The region is traditionally referred to as Uttarakhand in Hindu scriptures and old literature, a term which derives from Sanskrit uttara (उत्तर) meaning north, and khaṇḍ (खण्ड्) meaning country or part of a country. It has an area of 20,682 sq mi (53,566 km²). In January 2007, the name of the state was officially changed from Uttaranchal, its interim name, to Uttarakhand. The provisional capital of Uttarakhand isDehradun, which is also a rail-head and the largest city in the region. The small hamlet of Gairsain has been mooted as the future capital owing to its geographic centrality but controversies and lack of resources have led Dehradun to remain provisional capital. The high court of the state is in Nainital. Recent developments in the region include initiatives by the state government to capitalise on handloom and handicrafts, the burgeoning tourist trade as well as tax incentives to lure high-tech industry to the state. The state also has big-dam projects, controversial and often criticised in India, such as the very large Tehri dam on the Bhagirathi-Bhilangana rivers, conceived in 1953, the phase one of which has already been completed. Uttarakhand is also well known as the birthplace of the Chipko environmental movement, and other social movements including the mass agitation in the 1990s that led to its formation. Princely flag of Kingdom of Garhwal. Literally North Country or Section in Sanskrit, the name of Uttarakhand finds mention in the early Hindu scriptures as the combined region of Kedarkhand (present day Garhwal) and Manaskhand (present day Kumaon). Uttarakhand was also the ancient Puranic term for the central stretch of the Indian Himalayas. It is well known for the presence of a multitude of Hindu pilgrimage spots. The Pauravas, Kushanas, Kunindas, Guptas,Katyuris, Raikas, Palas, the Chands, and Parmaras or Panwars, Sikhs and the British have ruled Uttarakhand in turns. The region was originally settled by Kols, an aboriginal people of the austro- Asiatic physical type who were later joined by Indo-Aryan Khas tribes that arrived from the northwest by the Vedic period. At that time, present-day Uttarakhand also served as a haunt for Rishis and Sadhus. It is believed that Sage Vyasa scripted theMahabharata here as the Pandavas are believed to have traveled and camped in the region. Among the first major dynasties of Garhwal and Kumaon were the Kunindas in the 2nd century B.C. who practiced an early form of Shaivism. They traded salt with Western Tibet. It is evident from the Ashokan edict at Kalsi in Western Garhwal that Buddhism made inroads in this region. Folk shamanic practices deviating from Hindu orthodoxy also persisted here. However, Garhwal and Kumaon were restored to nominal Brahmanical rule due to the travails of Shankaracharya and the arrival of migrants from the plains. Between the 4th and 14th centuries, theKatyuri dynasty of Khas origin dominated lands of varying extent from the Katyur (modern day Baijnath) valley in Kumaon. The historically significant temples at Jageshwar are believed to have been built by the Katyuris and later remodeled by the Chands. Other peoples of the Tibeto-Burman group known as Kiratas are thought to have settled in the northern highlands as well as in pockets throughout the region, and believed to be the ancestors to the modern day Bhotiya, Raji, Buksha, and Tharu peoples. By the medieval period, the region was consolidated under the Garhwal Kingdom in the west and the Kumaon Kingdom in the east. From the 13th–18th century, Kumaon prospered under the Chand Rajas who had their origins in the plains of India. During this period, learning and new forms of painting (the Pahari school of art) developed. Modern-day Garhwal was likewise unified under the rule of Parmar/Panwar Rajas, who along with a mass migration of Brahmins and Rajputs, also arrived from the plains. In 1791, the expanding Gurkha Empireof Nepal, overran Almora, the seat of the Kumaon Kingdom. In 1803, the Garhwal Kingdom also fell to theGurkhas. With the conclusion of the Anglo-Nepalese War in 1816, a rump portion of the Garhwal Kingdom was reestablished from Tehri, and eastern British Garhwal and Kumaon ceded to the British as part of the Treaty of Sugauli. In the post-independence period, the Garhwal Kingdom was merged into Uttar Pradesh state, where Uttarakhand composed the Garhwal and KumaonDivisions. Until 1998, Uttarakhand was the name most commonly used to refer to the region, as various political groups including most significantly theUttarakhand Kranti Dal (Uttarakhand Revolutionary Party est. 1979), began agitating for separate statehood under its banner. Although the erstwhile hill kingdoms of Garhwal and Kumaon were traditional rivals with diverse lingual and cultural influences due to the proximity of different neighbouring ethnic groups, the inseparable and complementary nature of their geography, economy, culture, language, and traditions created strong bonds between the two regions.These bonds formed the basis of the new political identity of Uttarakhand, which gained significant momentum in 1994, when demand for separate statehood (within the Union of India) achieved almost unanimous acceptance among the local populace as well as political parties at the national level. Most notable incident during this period was the Rampur Tiraha firing case on the night of 1 October 1994, which led to public uproar. On 24 September 1998 Uttar PradeshLegislative Assembly passed the ‘Uttar Pradesh Reorganisation Bill’, 1998, which eventually led to the creation of the state, eventually the Parliament passed the Indian Federal Legislation - Uttar Pradesh Reorganisation Act 2000, and thus on 9 November 2000, Uttarakhand became the 27th state in the Republic of India. However, the term Uttaranchal came into use when the Bharatiya Janata Party (BJP)-led central and Uttar Pradesh state governments initiated a new round of state reorganization in 1998 and introduced its preferred name. Chosen for its allegedly less separatist connotations, the name change generated enormous controversy among the rank and file of the separate state activists who saw it as a political act, however they were not quite as successful as Jharkhandstate that successfully thwarted a similar move to impose the name Vananchal. Nevertheless, the name Uttarakhand remained popular in the region, even while Uttaranchal was promulgated through official usage. In August 2006, India’s Union Cabinet assented to the four-year-old demand of the Uttaranchal state assembly and leading members of the Uttarakhand movement to rename Uttaranchal state as Uttarakhand. Legislation to that effect was passed by the State Legislative Assembly in October 2006, and the Union Cabinet brought in the bill in the winter session of Parliament. The bill was passed by Parliament and signed into law by the President in December 2006. Since then, Uttarakhand denotes a state in the Union of India. Under the name of Greater Nepal, some in Nepal have asked for the return of states previously usurped by Nepal that were annexed by the British East India Company. However, little support for this motion exists in these regions. Nanda Devi is the second-highest mountain in India. Uttarakhand has a total geographic area of 53,566 km², of which 93% is mountainous and 64% is covered by forest. Most of the northern parts of the state are part of Greater Himalaya ranges, covered by the high Himalayan peaks and glaciers, while the lower foothills were densely forested till denuded by the British log merchants and later, after independence, by forest contractors. Recent efforts in reforestation, however, have restored the situation to some extent. The Himalayan ecosystem plays host to a large number of animals (including bharal, snow leopards, leopards and tigers), plants and rare herbs. Two of India’s largest rivers, the Ganges and the Yamuna originate in the glaciers of Uttarakhand, and are fed by myriad lakes, glacial melts and streams in the region. Uttarakhand lies on the southern slope of the Himalaya range, and the climate and vegetation vary greatly with elevation, from glaciers at the highest elevations to subtropical forests at the lower elevations. The highest elevations are covered by ice and bare rock. Below them, between 3,000 and 5,000 metres (9,800 and 16,000 ft) are montane grasslands and shrublands: the western Himalayan alpine shrub and meadows. Temperate coniferous forests, the western Himalayan subalpine conifer forests, grow just below the tree line. At 3,000 to 2,600 metres (9,800 to 8,500 ft) elevation they transit to the temperate western Himalayan broadleaf forests, which lie in a belt from 2,600 to 1,500 metres (8,500 to 4,900 ft) elevation. Below 1,500 metres (4,900 ft) elevation lie the Himalayan subtropical pine forests. The Upper Gangetic Plains moist deciduous forests and the drier Terai-Duar savanna and grasslands cover the lowlands along the Uttar Pradesh border. This belt is locally known as Bhabhar. These lowland forests have mostly been cleared for agriculture, but a few pockets remain. Indian National Parks in Uttarakhand include the Jim Corbett National Park (the oldest national park of India) at Ramnagar in Nainital District, Valley of Flowers National Park and Nanda Devi National Park in Chamoli District, which together are a UNESCO World Heritage Site, Rajaji National Park in Haridwar District, and Govind Pashu Vihar National Park and Gangotri National Park in Uttarkashi District. A Garhwali lady in traditional attire. Mindroling Monastery in Clement Town. According to 2011 India census, Uttarakhand had a population of 10,116,752. The native people of Uttarakhand are generally called either Kumaoni or Garhwali depending on their place of origin in either the Garhwal or Kumaon region. Another well known category is Gujjar, they were the rulers of a kingdom with capital at Landhaura of gurjar partihar dynasty,Hindu gurjar is power ful than other Muslim gurjar of the state landhora gurjar was a big riyasat of gurjar’s in past and which covered the whole of today’s Haridwar District. Gujjars King Raja Ramdayal Singh Panwar had helped theTehri ruler against the Gorkhas and the Present MLA from Laksar in Haridwar is Kunwar Pranav Singh Champion is the descendant of that King. Gujjar is a dominant community of Haridwar District. Kumaoni and Garhwali dialects of Central Pahari are spoken in Kumaon and Garhwal region respectively. Jaunsari andBhotiya dialects are also spoken by tribal communities in the west and north respectively. The urban population however converses mostly in Hindi. Sanskrit has also official status in the state. Hindus form the majority of the population at 85.0%, Muslims form 10.5%, Sikhs 2.5% and Christians, Buddhists, Jains and others about 0.5%. It has male-female ratio of .963 and has a literacy rate of 79.63%. The largest cities in the state include Dehradun (530,263), Haridwar (220,767), Roorkee (158,896),Haldwani (145,278) and Rudrapur (88,720). The state government recognizes 15,620 villages and 81 cities and urban areas. Historians of Kumaon and Garhwal say that in the beginning there were only three castes: Rajput, Brahmin and Shilpkar. Main occupation of Rajput wereZamindari and law enforcement. Occupation of Brahmins were to perform religious rituals in temples and religious occasions. Shilpkar were mainly working for rajputs, in their lands and were expert in handcrafts. The famous surnames Pundir, Kalakoti, Chauhan, Bashera or Basera, Bisht, Bhayera, Nainwal, Rawat,Dhapola, Rautela and Negi are used by Rajputs. Bahuguna, Painuly (Panuly), Kukreti, Bhatt, Nautiyal, Naithani, Joshi, Tripathi, Pant are some of the famous Brahmin surname, also having a university by the name of Bahuguna in Pauri district of Garhwal. According to a 2007 study, Uttarakhand has the highest percentage of brahmins of any state in India, with approximately 20% of the population being brahmin. Bhagirathi River at Gangotri, source stream of the Ganges. The present Chief Minister of Government of Uttarakhand is Mr.Vijay Bahuguna.He was appointed as the seventh Chief Minister of Uttarakhand.Governor Margaret Alva administered the oath of office and secrecy to Mr.Bahuguna, who became the CM for the first time. The last state elections in Uttarakhand were held on 30 January 2012. The Indian National Congress emerged as the largest party with 32 seats in the 70-seat Uttarakhand Legislative Assembly. Three seat short of forming a majority, the Congress have had to rely on support from the Uttarakhand Kranti Dal,three independents and the Bahujan Samaj Party to form the government. The BJP is the official opposition, holding 31 seats. The First State Assembly for Uttarakhand was carved out from the Vidhan-Sabha of Uttar-pradesh for which elections were held in 1996. In UP Assembly, the number of seats for the area consisting of Uttarakhand were 26. The First State Assembly consisted on these 26 Seats. BJP which had won 17 Seats out of these 26 Seats formed the Government under Nityanand Swami. Swami was replaced by Bhagat Singh Koshiyari in 2001. The BJP rule was marred by severe internal factionalism which made the party unpopular. The State Elections for Second State Assembly were held on 14th Feb,2002. A Total of 927 Candidates were in fray. Congress won the simple majority with 36 Seats and Narayan Dutt Tiwari was elected as the Chief Minister. The State clocked an impressive 14.5% growth during the Congress rule, however, there was widespread disenchantment with the style of functioning of the Chief Minister. The State Elections for Third State Assembly were held in March-2007. None of the parties got the clearcut majority. BJP emerged as the largest party with 34 seats followed by Congress with 21 Seats. Bahujan Samaj Party(BSP) made impressive gains with 07 Seats though its success was more attributed to rebels of BJP joining BSP. Uttarkhand Kranti Dal managed 3 Seats. BJP formed the government along with Uttarakhand Kranti Dal and Maj.General B.C.Khanduri was appointed as the Chief Minister. B.C.Khanduri continued as Chief Minister till End-2009 when he was removed due to shocking defeat of BJP in all the five Lok Sabha Constituencies of Uttarakhand in May-2009. Khanduri was replaced by Ramesh Pokhriyal “Nishank” who was a Teacher by profession. However, due to widespread disenchantment with the BJP Government’s lack lustre performance under Pokhriyal’s leadership, he was replaced with B.C.Khanduri in End-2011. Taking advantage of the wide spread Anna Hazare’s movement against Corruption, Khanduri immediately introduced and got passed the Uttarakhand Lokayukta Bill in line with Anna Hazare’s Jan Lokpal Bill and got kudos from the Media,Anna Hazare and people at large. This single step brought BJP in the election fray for the coming Assembly Elections in Jan-2012. The State Elections for Fourth State Assembly of Uttarakhand were held on 30-01-2012. Total 788 Candidates were in fray. The main parties were BJP, Congress and BSP. The results were announced on 6 March 2012 and no party got a majority. The Congress emerged as the largest party with 32 seats with BJP at 31 seats. BSP got 3 seats, Uttarakhand Kranti Dal 01 Seat and Independent 3 seats. The surprising result was that although the ruling party BJP made a comeback in the elections under Chief Minister B.C.Khanduri but Khanduri himself lost his Kotdwar Seat, whereas Ramesh Pokhriyal won his Doiwala Seat. Immediately after the results were announced, both Congress and BJP started manuoveres to form the next government along with BSP and independents. Congress party was able to secure the support of three independents and one UKD candidate and submitted its claim for forming the government. Congress was later joined by the three MLAs of BSP. The sitting MP from Tehri-Garhwal Region Vijay Bahuguna was nominated as Chief Minister by the Congress High Command. There are 13 districts in Uttarakhand which are grouped into two divisions, Kumaon and Garhwal. Four more districts namely Didihat, Ranikhet, Kotdwar and Yamunotri were declared by the then CM of Uttarakhand, Ramesh Pokhariyal on 15 August 2011. However, these districts have not been created yet. The Kumaon division includes six districts. The Garhwal division includes seven districts. Each district is governed by a district commissioner or district magistrate. The districts are further divided into sub-divisions, which are governed by sub-divisional magistrates; sub-divisions comprise blocks containing panchayats (village councils) and town municipalities. As per the 2011 census, Haridwar, Dehradun, Udham Singh Nagar are the most populous districts, each of them having a population of more than one million. A view of the Nainital lake. The size of Uttarakhand’s Economy as measured by its Gross State Domestic Product (GSDP) for 2011 (Financial year ending March 2011) is estimated at 775.8 billion in current prices. Born out of the division of Uttar Pradesh, the new state of Uttarakhand produces about 12% of the output of the old Uttar Pradesh state. Consolidated Finvest and Holdings, a S&P CNX 500 conglomerate has its corporate office in Uttarakhand. It reported a gross income of 137 million for 2005. In 2003, a new industrial policy for the state with generous tax benefits for investors was initiated that has led to a massive upsurge of capital investment.SIDCUL, the State Industrial Development Corporation of Uttarakhand has established seven industrial estates in the southern periphery of the state, while dozens of hydroelectric dams are being built in the upper reaches. However, hill development remains an uphill challenge as out migration of local peoples continues from the highland hinterlands. 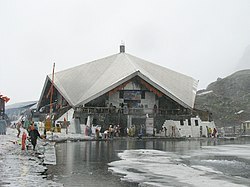 Gurudwara Hemkund Sahib, an important pilgrimage site for Sikhs. Leisure, adventure, and religious tourism play a prominent role in Uttarakhand’s economy, with the Corbett National Park and Tiger Reserve and the nearby hill-stations of Nainital, Mussoorie, Almora, Kausani, Bhimtal and Ranikhet being amongst the most frequented destinations of India. The state also contains numerous peaks of interest to mountaineers, although Nanda Devi, the highest and best-known of these, has been off-limits since 1982. Other national wonders include the Valley of Flowers, which along with Nanda Devi National Park, form a UNESCO World Heritage Site. To Uttarakhand, long called “abode of the gods” (Devbhumi), belong some of the holiest Hindu shrines, and for more than a thousand years, pilgrims have been visiting the region in the hopes of salvation and purification from sin. Gangotri and Yamunotri, the sources of both the Ganges and Yamuna fall in the upper reaches of the state and together with Badrinath (dedicated to Vishnu) and Kedarnath (dedicated to Shiva) form the Char Dham, one of Hinduism’s most spiritual and auspicious pilgrimage circuits. Haridwar, meaning “Gateway to God” is a prime Hindu destination. Haridwar hosts the Kumbha Mela every twelve years, in which millions of pilgrims take part from all parts of the India and the world. Rishikesh near Haridwar is known as the preeminent yoga centre of India. The state has an abundance of temples and shrines, many dedicated to local deities or manifestations of Shiva and Durga, references to many of which can be found in Hindu scriptures and legends. The architecture of most of these temples is typical of the region and slightly different from other parts of India. The ancient temples at Jageshwar (a complex of 124 temples in a deodarwoodland) are historically the most prominent for their distinct architectural features. Uttarakhand is, however, a place of pilgrimage not only for the Hindus. Hemkund nested in the Himalayas is a prime pilgrimage center for theSikhs. Tibetan Buddhism has also made itself felt with the recent reconstruction of Mindroling Monastery and its Buddha Stupa, touted as the world’s highest, southwest of Dehradun. The state has always been a destination for mountaineering, hiking and rock climbing in India. A recent development in adventure tourism in the region has been white water rafting and other adventures sports. Eco tourism, agritourism and rural tourism have also found new grounds in many villages of the state. Forest Research Institute, Dehradun, distant view. Uttarakhand is home to several important educational institutions, including the oldest engineering colleges in Asia, the Indian Institute of Technology atRoorkee and Govind Ballabh Pant University of Agriculture & Technology in Pantnagar.Other universities and institutes of prime importance include, Indian Military Academy in Dehradun, Forest Research Institute in Dehradun, Govind Ballabh Pant Engineering College in Pauri and Bipin Chandra Tripathi Kumaon Engineering College, Dwarahat. Uttarakhand is home to several reputed and prestigious day and boarding schools including G D Birla Memorial School, Ranikhet, St. Joseph’s College(Nainital), The Rashtriya Indian Military College (RIMC) (Dehradun) The Doon School (Dehradun), Welham Girls School (Dehradun), Welham Boys School(Dehradun), Summer Valley School (Dehradun), SelaQui International School (Dehradun), Brightlands (Dehradun), St. Joseph’s Academy (Dehradun),Woodstock School (Landour), St. George’s College (Mussoorie), Birla Vidya Mandir (Nainital), Sherwood College (Nainital), All Saints’ College (Nainital), St. Mary’s Convent (Nainital). Several Indian luminaries have attended these schools including former prime ministers and film stars. Historically, Uttarakhand is believed to be the land where the Vedas and the Shastras were composed and the great epic, the Mahabharata, was written.Rishikesh is widely considered the Yoga capital of the world. Although the entertainment industry of Uttarakhand is in its infant stage, yet there is a rapid growth in terms of audio visual entertainment. The pure folk seems to be disappearing from villages, so is the younger generation. Still there are many options one can get close to the folk music. Recently, in the honor of all who gave Bedupako Baramaasa folk tune an international fame and also to make Uttarakhand folk available all around the world 24X7, an online radio, which is one of the only and very first on-line radio of Uttarakhand available on web, was created by the name of bedupako. Dear readers, our primary reference for this article is wikipedia and we encourage you to read the original article at “http://en.wikipedia.org/wiki/Uttarakhand”. ^ ”Sanskrit is second official language in Uttarakhand”. Retrieved 2012-03-10. ^ Uttarakhand Govt. of India, Official website. ^ Yadav, K. P. S. (2002). Going Under: Tehri prepares for a watery grave as the controversial dam becomes a grim reality. Its residents are in mourning, their grief compounded by an uncertain future. Down To Earth, 10(16), 20. ^ Guha, R. (2000). The unquiet woods: ecological change and peasant resistance in the Himalaya (Expanded ed.). Berkeley, Calif.: University of California Press. ^ Kandari, O. P., & Gusain, O. P. (Eds.). (2001). Garhwal Himalaya: Nature, Culture & Society. Srinagar, Garhwal: Transmedia. ^ Saklani, D. P. (1998). Ancient communities of the Himalaya. New Delhi: Indus Pub. Co.
^ Pande, B. D. (1993). History of Kumaun: English version of “Kumaun ka itihas”. Almora, U.P., India: Shyam Prakashan: Shree Almora Book Depot. ^ Rawat, A. S. (1989). History of Garhwal, 1358-1947: an erstwhile kingdom in the Himalayas. New Delhi: Indus Pub. Co.
^ Saklani, A. (1987). The history of a Himalayan princely state: change, conflicts and awakening: an interpretative history of princely state of Tehri Garhwal, U.P., A.D. 1815 to 1949 A.D. (1st ed.). Delhi: Durga Publications. ^ Aggarwal, J. C., Agrawal, S. P., & Gupta, S. S. (Eds.). (1995). Uttarakhand: past, present, and future. New Delhi: Concept Pub. Co.
^ Kumar, P. (2000). The Uttarakhand Movement: Construction of a Regional Identity. New Delhi: Kanishka Publishers. ^ Rampur Tiraha firing The Times of India, 31 Jul 2003. ^ Reorganisation Bill passed by UP Govt The Indian Express, 24 September 1998. ^ Negi, B. (2001). “Round One to the Lobbyists, Politicians and Bureaucrats.” Indian Express, 2 January. ^ UNI. (2006). “Uttaranchal becomes Uttarakhand.” Tribune (India), 12 October. ^ Negi, S. S. (1991). Himalayan rivers, lakes, and glaciers. New Delhi: Indus Pub. Co.
^ Negi, S. S. (1995). Uttarakhand: land and people. New Delhi: MD Pub. ^ ”Census Population” (PDF). Census of India. Ministry of Finance India. Retrieved 2008-12-18. ^ ”Various State Symbols of Uttarakhand”. gmvnl-Garhwal mandal vikas nigam limited. Retrieved 2012-04-01. ^ Dilwali, A., & Pant, P. (1987). The Garhwal Himalayas, ramparts of heaven. New Delhi: Lustre Press. ^ PTI. (2002). “Dalai Lama Inaugurates World’s Highest Stupa.” 28 October.